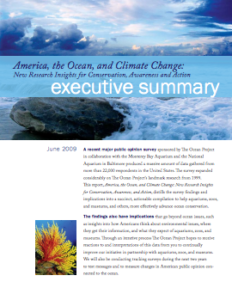 Below you will find our reports that investigate attitudes and opinions on environmental, ocean, and climate change issues. Most of this research was conducted in the United States and Canada, but also includes data from seven other countries. From our regular monitoring of domestic and international research, we believe that overall findings and recommendations will apply in many cases in a range of countries. Of course, each situation is unique and we recommend getting to know your target audience very well to make your outreach and engagement as effective as possible. All of these files are free to download. 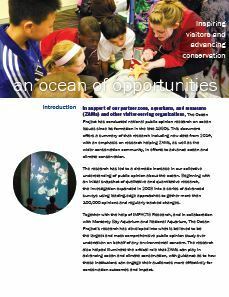 The Ocean Project is pleased to present a summary of nearly 20 years (1998-2015) of communications research, An Ocean Of Opportunities. 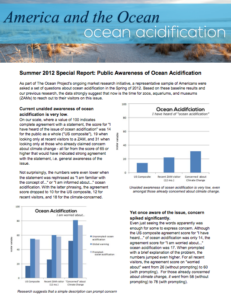 In 2012, The Ocean Project completed a year-long research project on the state of ocean acidification communication. 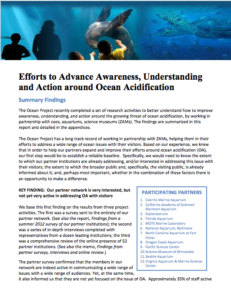 Given the importance of establishing a reliable baseline in order to help our partners expand and improve their efforts around ocean acidification, we conducted a study to better understand how to improve awareness, understanding, and action around this growing environmental threat. 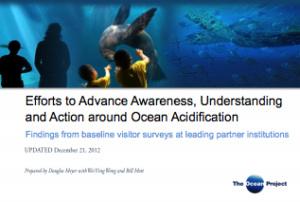 The report explores the ways in which partner institutions are already addressing or are interested in addressing ocean acidification with their visitors as well as the extent to which the broader public and specifically the visiting public is already informed about it. 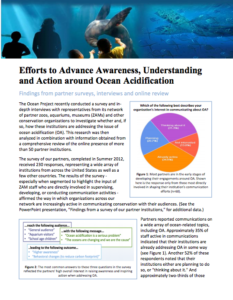 Perhaps most importantly, the report addresses where there is an opportunity to advance conversations about and engagement with the issue of ocean acidification. 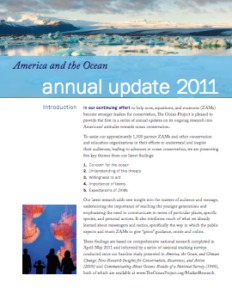 This comprehensive report for 2011 includes insights on the American public’s knowledge and perception of ocean and related environmental issues. Findings are compared against our 2009 baseline study – America, the Ocean, and Climate Change. 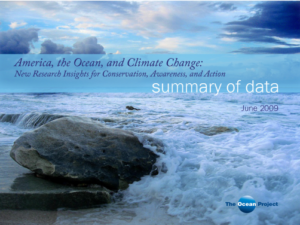 America, the Ocean, and Climate Change reports on a comprehensive survey of more than 22,000 American adults, the most extensive communications research ever undertaken on any environmental issue. It provides critical insights into who, what, when, and how to target for maximum efficacy in communicating for conservation action. 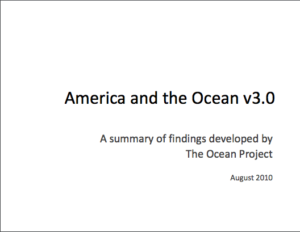 The Ocean Project undertook a series of tracking surveys to measure changes in public perceptions and opinions over a period of three years, allowing us to provide our partners with strategic communications information. Tracking surveys provide critical information and insights that help you maximize your conservation impact. 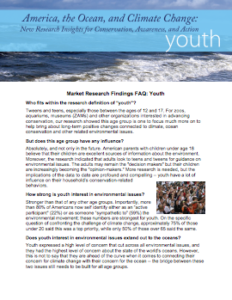 Youth have consistently been identified as a critical constituency in our research. What do we know about this target audience? What are the best ways to reach them? 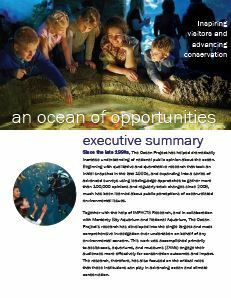 This fact sheet provides important findings and implications for reaching out to this important audience. 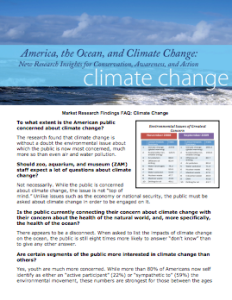 What does the public know and believe about climate change? Climate change is increasingly seen as a politicized issue, and continues to be seen as distinct from ocean health. Download these documents if you’re interested in delving more into our communications research. These files are fairly large, so download at your discretion. If you have issues or questions that you would like us to track, please contact Bill Mott.